WARNING: In The Wonder Weeks, full version, all ten leaps are described. This chapter book only describes the 10th leap. 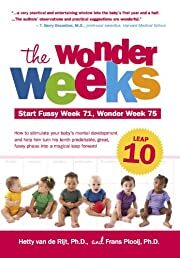 The Wonder Weeks, start fussy week 71, Wonder Week 75, Leap 10. How to stimulate your toddlers mental development and help him turn this predictable, great, fussy phases into a magical leap forward, describes in easy-to-understand terms the incredible developmental changes that all toddlers go through 75 weeks after the due date (start fussy period at 71 weeks). At the tenth leap, around 75 weeks or a good 17 months, your toddler gets the new ability to observe and manipulate "systems." Just as her programs were rigid before she had risen to new heights after taking her ninth leap, so too were her principles lacking certain flexibility before this tenth leap. She was only able to apply them in a set way, always the same, regardless of the situation.